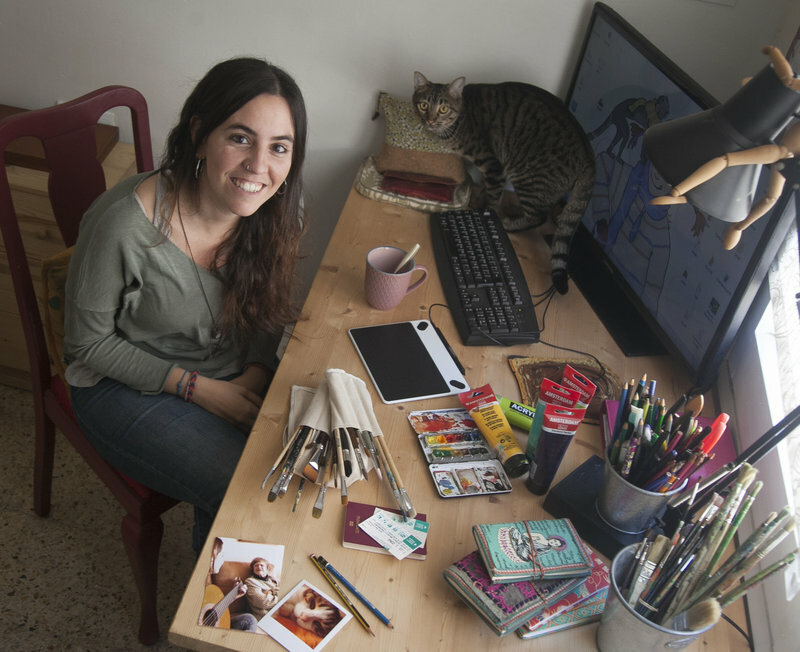 Elisabet was born in Igualada in 1986, probably with a pencil in her hand. As a little girl, she visited Plarin Bayés with her parents and fascinated by her work, she decided to become an illustrator. A graduate in Fine Arts and passionate about the world of children, she has given drawing and painting workshops at libraries, schools and arts centres. Her characters fill stories, books, posters and walls, and she has two new books on the way: Mig adormits and Quin cacau! 1. A pencil: I always have one with me. I do my drawings by hand, I like to maintain that tradition, although I use the computer more often to finish the illustrations. 2. Computer and Wacom tablet: the tools I use to finish the drawings. Also, I always use the computer to listen to music when I work, especially Catalan rock and rumba. 3. One of my cats: I love animals! I live with two of them, Miquel and Jan. I think of them as my co-workers. When I’m working, here at the desk, the table, at the keyboard... they’re always there. 4. My grandma: I always have her photo by the computer; she’s been a very special person for me. I spent part of my childhood with her and we shared many moments together, filled with so much magic. Grandparents... are special. 5. Brushes and paints: I prefer the Escoda brand, made in Sabadell. One thing I really love about my work is when they paint murals in schools, activity centres, workshops... The world of children is my other passion, I like how they see the world and maybe that’s why I do children’s drawings. I really like these moments when I visit and share things with the children, they explain things, they ask questions, you learn a lot from them! I use watercolours for my personal projects and for more special occasions, otherwise I use normal acrylic paints. 6. Coffee: indispensable for work and to start the day. There’s always a cup of coffee with oat milk on my desk. 7. Colours: I love colours, I don’t think I could live without them, (laughs). They’re an essential part of my drawings, which always include lots of different colours - especially turquoise! 8. Tickets and passport: I like to move around, and sometimes I have to get around by bus or train for work. Travel allows me to get to know other places and different cultures and I often incorporate them into my illustrations. 9. Notebooks: I always use notebooks and notepads to make sketches, or take them on trips to take quick notes of things that I see and like.